Why is my air conditioner vent leaking water? 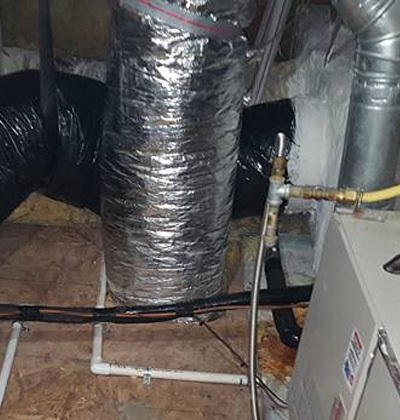 Why is there is there water in my ductwork? Condensation on ductwork is a major problem here in the southeast. With the ever-increasing popularity of putting the air conditioning ducts outside the conditioned space; many contractors and homeowners in humid climates are now experiencing ac vents and duct sweating. Most of these sweating ducts are carrying cool supply air, although sometimes return air ducts can sweat, especially if the house is kept very cold and the return ducts run through cool vented crawlspaces. What causes condensation on ac vents? Ducts sweat because the outside surfaces of the ducts are below the dew point of the air in their immediate surroundings. The primary ways to stop ducts from sweating is to raise the surface temperature of the ducts or to lower the dew point of the air surrounding the duct by some form of dehumidification. The dew point of air is the temperature at which the amount of water vapor in the air is the maximum amount the air can hold. 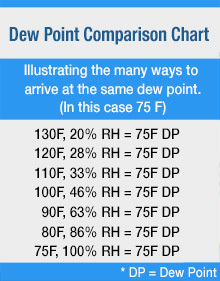 The dew point is the same as air at 100% relative humidity. There are several ways to raise the outside surface temperature of the ducts. The first is to raise the temperature of the air inside the ducts. One of the easiest ways to do this is to raise the room temperature or the return air temperature. Homes with low thermostat settings are more prone to having ducts sweat. If the room temperature is 70F, and the thermostat is turned up to keep the room at 75F, the chance of the ducts sweating is reduced. If the return air temperature is raised 5F, and the temperature drop across the indoor coil is kept at 20F, the supply air temperature will go up 5F. For supply ducts, another way to raise the outside surface temperature is to increase the air flow in the system. I have been measuring air flow in air conditioning systems with a flow hood since 1988. Half of the systems that I’ve measured are supplying 200 cfm per ton or less. When a system is operated with low air flow, the cooling coil gets colder; so the supply air is colder than normal. This makes the outside surface of the duct colder also. Therefore, if the supply ducts are sweating, measure the system air flow to be sure it’s adequate for the system. Another consideration is the temperature of the air surrounding the ducts. Raising this temperature will raise the outside surface temperature of the ducts. If the ducts are installed in a cool crawlspace, they are more likely to sweat than ducts installed in a hot attic. In many cases, consumers are advised to add exhaust fans to their attics. Running these fans excessively and bringing in cooler outside air can cool the duct surface temperature in the attic to below the dew point and start forming condensate on the duct surfaces. Adding exhaust fans to a crawlspace can also aggravate the problem. 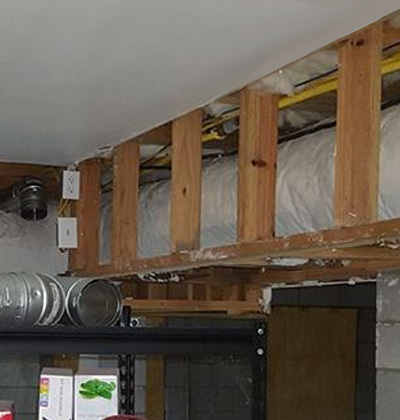 Because crawlspaces are typically cool, if the air outside has a dew point above the surface temperature of the ducts, more moisture is added to the crawlspace in the form of humidity. The condensation will become more rapid, increasing the amount of liquid water present in the crawlspace. Another way to decrease the amount of duct condensation is to dehumidify the space around the duct. This would normally be done by installing a dehumidifier, such as when the ducts are in a crawlspace. By closing the crawlspace and installing a dehumidifier, the air in the crawlspace is dried out, lowering the dew point temperature of the air. With a lower dew point of the air surrounding the duct, it’s less likely for the ducts to sweat. You can increase the outside surface temperature of the duct by raising the air temperature inside the duct, by raising the temperature of the air surrounding the duct, or by adding insulation to the duct. This can be as simple as using proper installation techniques when installing the duct wrap on sheet metal ducts. Often, when installers wrap the duct, they compress the insulation to “make it look nice.” However, by pulling the duct wrap tight during installation, duct wrap with an R-6 rating can be effectively reduced to R-3 or less. Be careful when adding insulation to an already insulated duct. If the vapor barrier on the outside of the new insulation is not well sealed, moist air can get between the layers of insulation. This can cause condensation to occur inside the insulation, destroying the insulation R-value and putting you back where you started. Air turbulence inside ducts can affect the R- value of the duct insulation. If you install an elbow or bullhead tee near the discharge of the blower, you will create turbulence inside the duct that increases heat transfer out of the duct, making it cooler. In some cases, this can make the difference between ducts sweating and not sweating. Adding turning vanes inside the fitting can fix this problem and increase air flow as well. Be careful when increasing the air flow in an air conditioning system to increase supply air temperature. Doing so may reduce duct sweating, but will also reduce the dehumidification done by your air conditioner or heat pump. Another duct sweating dilemma is caused by poorly sealed sheet metal ducts with duct wrap over them. When air leaks out of the duct, it’s trapped by the duct wrap vapor barrier. The cold supply air flows through the insulation on its way to the nearest tear or opening in the duct wrap vapor barrier. In the process, the surface of the vapor barrier assumes the supply air temperature. Therefore, the duct sweats over the path from the duct leak to the duct wrap leak. If the metal ducts are not sealed at all, the entire surface on the duct wrap vapor will sweat. 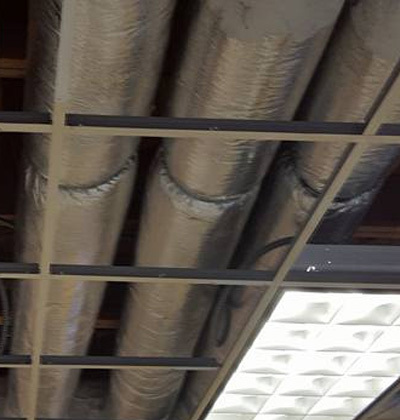 For this reason, we recommend ductboard and flex over wrapped sheet metal ducts in high humidity areas. Properly fabricated ductboard has tight corners, keeping the supply air away from the outer surface of the duct. Therefore, the full rated R-value of the duct is achieved. The same holds true with flex ducts. When installing flex ducts, you only need to seal it at the ends, where it connects to the starting collar and the boot. You don’t need to seal three to five elbow gores at every bend, and the pipe every five feet. As long as you don’t crimp the flex, or use very narrow straps to support it, the full rated Rvalue of the flex is achieved. It’s also possible for ducts to sweat at the exit point of the air leaking from the duct. This is common at poorly fitting or poorly sealed flex duct starting collars, and is especially true in cool crawlspaces. The trunk duct surface around the leaking starting collar will be chilled, and will sweat. Another thing that causes ducts to sweat is when they are run through trusses or supported by the building structure in a crawlspace. It the duct is supported by the web of a truss, air is trapped between the duct and the truss. Because no new heat is added to this air, the cool supply air in the duct gradually cools the pockets of air outside the ducts. Running ducts next to insulation or other ducts can have the same effect. 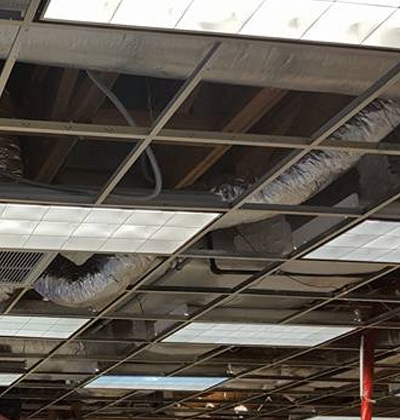 These ducts will then sweat where they touch or come close to other supply ducts, building insulation, or building materials in any closed space. As you can see, there are many causes of sweating ducts. Careful installation and insulation practices will prevent most of them, but when you encounter one on a service call, I hope the information I’ve presented here will help you solve the case. Need Help with AC Duct Condensation? 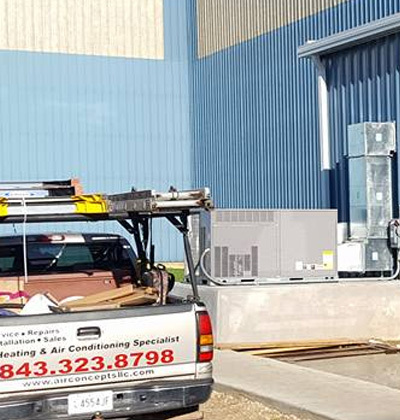 "We wouldn't consider going anywhere else but Air Concept Solutions, your technician, was very knowledgeable, professional and eager to help us. Thank you for the great customer service. "